There are over 30 professionally designed e-books written by veterinarians for you to send to your clients. 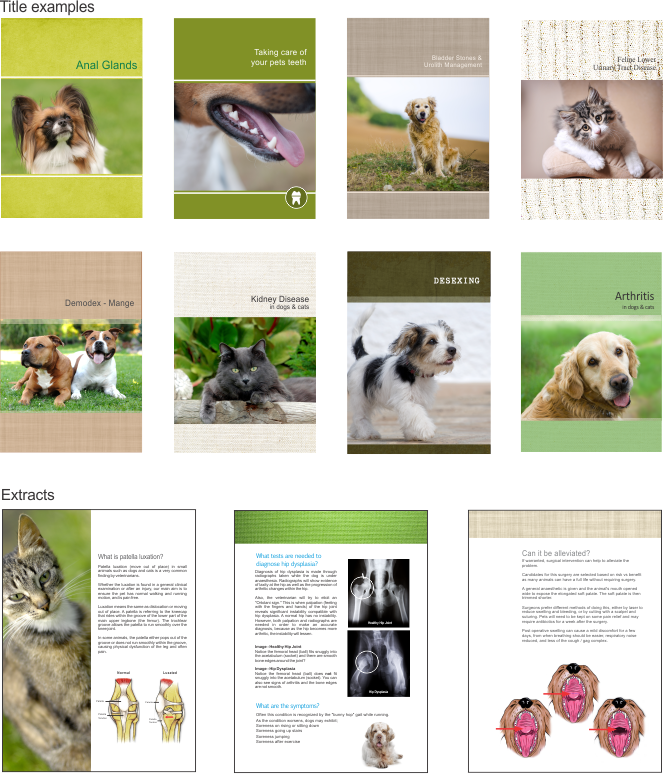 The e-books will help explain to your client their pet’s condition. It will also explain the treatment and prognosis and in some cases eg cruciate repair and desexing, it will explain the after care required. These e-books are full colour throughout including full colour photographs and diagrams. E-books can be opened from within the iConsult or emailed direct from your iPad with the press of one button. Don’t wait for your client to come into the practice to be impressed with your level of education. Why not send the dental e-book out to your entire database with a promotion for dental awareness month or maybe send the arthritis e-book out to all large dog owners or elderly cats on your database with a promotion for arthritis awareness, or maybe send out the ebook on FLUTD to promote the premium food your practice promotes. You get the picture? Use the iConsult for promotional campaigns and increase the frequency of visit from your existing clients. Request a free trial today and see for yourself!